I'm hanging out with Minnesota friends & having a lovely time. I'm writing & relaxing & loving where & who I am. 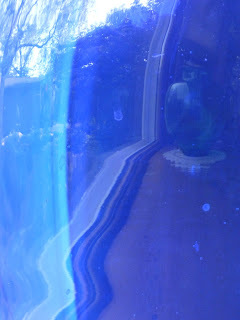 Not rose colored glasses, but cobalt blue, which does not mean the blues. I wish for you the beauty of blue or gold or red or green, or whatever your favorite filter. Maybe pink. Joying the journey. In joying. Enjoying. I wish you joy. I wish you journey. One step at a time, which is the only way you can experience a journey.